I have spring fever, y’all! Spring was never my favorite season – until I became a gardener. Now I have to stop myself from going out there every hour to see what has changed and if anything has noticeably grown, because at this time of year the plants and flowers are just exploding. It’s all I can do to concentrate on anything other than plants and planting, to the extent that Adam actually had to ask me to other night if I could please talk about something other than gardening…and it effectively shut me up. 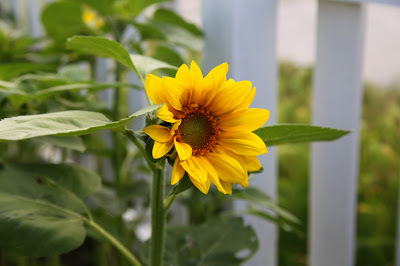 Every time I had a thought or something to share, it was inevitably about how big the corn is getting, how many snow peas we might harvest for dinner tomorrow, or wondering how tall the hollyhocks are going to get and whether they will need staking. Now he knows what to say to get some peace and quiet. Now that the garden is in full spring swing, I thought it would be fun to add a little whimsy here and there. I’ve always got ideas percolating about how I can turn some junk I found at a garage sale or on the side of the road into some little treasure for my front yard garden. With all this gardening enthusiasm I’ve had of late, I’ve put that energy to good use by finally getting to many of these little projects. I’m pretty pleased with how they’ve all turned out so far. I saw others like this on Pinterest, so when I happened across a dirt-encrusted chandelier at a garage sale for $20 (it still had the antique store price tag on it, where it was listed for $395!) I knew it needed to be the new upscale restaurant in the yard for my bird friends. A little cleaning and spray paint was in order, and I made the feed cups from some Trader Joes chicken breast cans which I attached with a little epoxy. 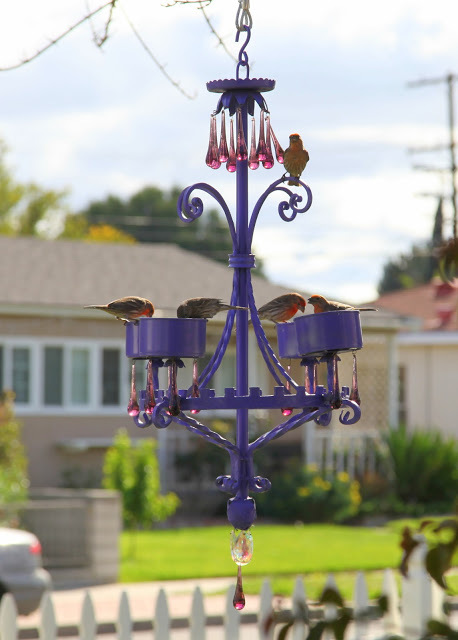 I think it adds just the touch of whimsy I was hoping for, and the birds definitely seem to like it (especially the house finches you see here). Another Pinterest creation, I’ve been thinking about adding a little “gnome home” to the tree in the front yard since last summer. 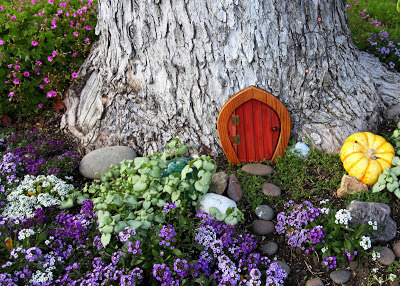 I finally dug up the soil around the tree and purchased the miniature door on Amazon. It’s about the most adorable thing out there. I planted some alyssum and some dead nettle, and decided to keep the oxalis weeds growing there, too, since they are awfully pretty. 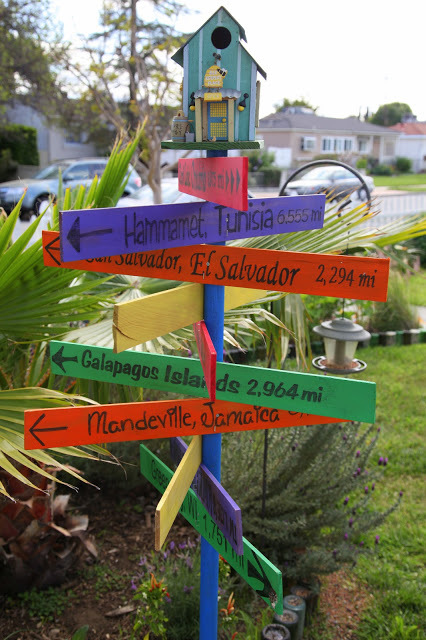 Another project I’ve been daydreaming about since last year was adding a signpost to the front yard with signs pointing to some of the places we’ve visited over the years. The most challenging part of the project was choosing which places to include. I learned a neat trick from another blog about how to add the lettering, and Adam borrowed a post-hole digger from the neighbor to install it for me. Of course, no signpost is complete without a birdhouse on top (which I snatched for $1 from a garage sale in Indiana while I was home visiting the folks). Now when I look out the kitchen window I’m reminded of some of our adventures, and the birds have yet another place to perch. I hope this inspires you to create some whimsy of your own! If you need me, I’ll be in the garden.